All of the fabric used in the designing of the vest is 100% cotton (NO SYNTHETIC MATERIALS), and pre-washed- see patterns below. Dry cleaning is recommended so your OLD TIME VESTED COWBOY VEST keeps its shape. EVERYTHING on this vest is hand sewn…, all the way from the buttons the to toughness of the Pockets. LONGHORN HATTERS ASSURES YOU THAT THIS VEST IS MADE IN THE USA. Since all of the vests are custom made one at a time, Vest reproductions and PERSONAL DESIGNS are available for an extra fee. In this instance, personal consultation is necessary and payment will be through LONGHORN HATTERS MERCHANT ACCOUNT. The extra fee would include special fabrics, custom patterns, personal consultation with LONGHORN HATTERS and then personally relaying this information to the personal designer and seamstress. All material and patterns are based upon availability. A note of interest, ALL CUSTOM VESTS ARE GUARANTEED on quality and workmanship!! There is a choice of six(6) material pattern selections. Patterns were chosen very carefully from actual samples of the period of the 1880 OLD WEST. Because of the complexity of this Custom Vest, upon ordering, you will receive a personal call from Don Livingston's LONGHORN HATTERS confirming your order working out all specs before consigning the OLD TIME RIO GRAND COWBOY LAPELED VEST to the seamstress. At this time all construction will be discussed (below) for your CUSTOM built Vest to see that your design is intact. Don Livingston - LONGHORN HATTERS"
Your Old time Rio Grande lapeled Cowboy Vest comes with choices of the following selections. Who puts your Custom Rio Grande Vest together? 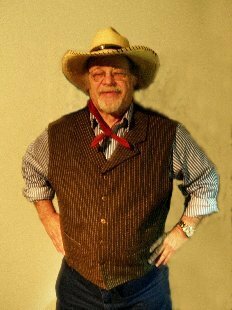 Don Livingston's LONGHORN HATTERS is proud to announce the association of Terry Heffner, Master Seamstress, to help in the design of the new COWBOY FIXIN'S OLD TIME RIO GRANDE LAPELED COWBOY VESTS to be featured on the LONGHORN HATTERS Web Site, and on property store sales. Mrs Heffner has sewed for people for over 30 years starting in middle school, and eventually added Custom Civil War and Old West clothing items about 20 years ago to her skills. She says, “Now that there are fabrics out there from the Smithsonian, customers can almost be taken back to the Old West with the designs. The above is called heart, and a love for what one does, so if it’s a planned Vest, or one that matches a movie star, this talented Wardrobe Designer can build it. When one consigns LONGHORN HATTERS for one of the six featured Custom Vests, it should be noted that there is a limited amount of “each piece”, so duplication is kept to a bear minimum. 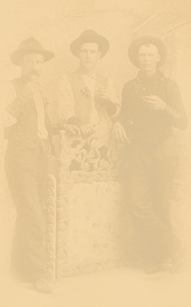 In addition to the Custom Vests, other Old West Period Clothing such as shirts, blouses, dresses, pants, and coats could also be offered in the future. NOW......, how 'bout an OLD TIME CUSTOM RIO GRANDE COWBOY LAPELED VEST??? For further information RE: ordering at this time, Email LONGHORN HATTERS at don@longhornhatters.com, or call: 210-348-7042.